What Is Content Marketing And How Can You Use It To Grow Your Business? Continuing with our online marketing tips series, we focus our attention to content. If you haven’t noticed already, 2013 is the year of content marketing. Don’t get us wrong – a solid content marketing strategy should still be at the top of your list for SEO purposes, but ultimately, content needs to be written for humans, not to satisfy Google’s ranking algorithm. No matter what kind of business you’re in, you need a content marketing plan that is useful, on-brand, and above all, sticky enough to keep your audience coming back for more. 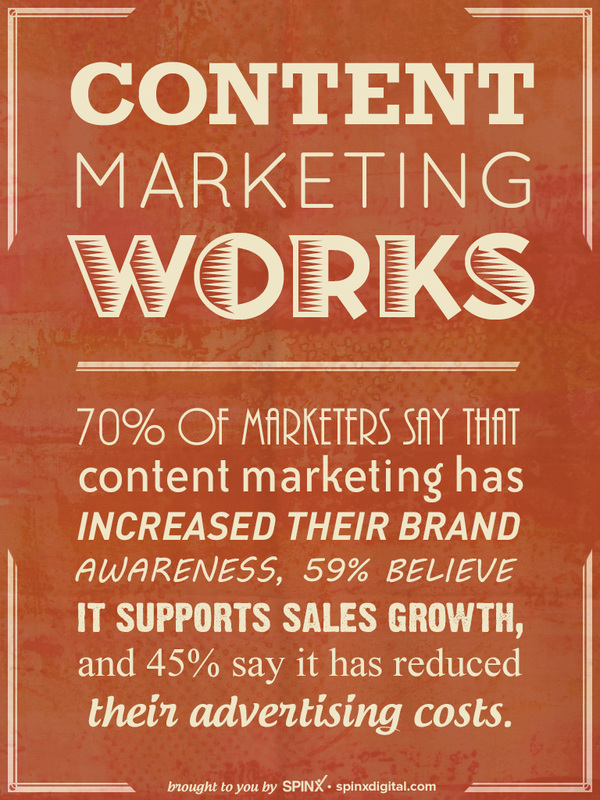 Content marketing is so important that 70% of marketers say content marketing has increased their brand awareness, which means consumers recognize and associate the content with that particular brand. A good example of this would be Old Spice, because their content is consistent and always tied back to the brand. Another 59% of marketers believe that content marketing supports sales growth, and 45% say it has reduced their advertising costs. Great Tip, But How Can I Use It? Goals: First, you need to ask yourself what your objective is. Set some goals and guidelines, whether it’s increasing your Facebook fan base or growing your newsletter subscribers. This will help determine what kind of content you generate and the tone you’d like to set for your company profile. Do you want to be an industry leader? A resource of information? A place for fans to to catch the latest company news? No matter what it is, defining your goals will help inform the content you create. Pick Your Content: Next, choose content that coincides with your goals. A big factor to consider is how much time and available resources you have to spare. If you’re short on time and resources, you might want to stick to social media outlets (namely Facebook, Twitter, Google Plus, plus loads of others) and write some informative blog posts. If time and resources aren’t an issue, you might want to create infographics, podcasts, custom images, or even broadcast a webinar. That said, a good rule of thumb might be to stick to a few outlets, and do them well. There’s no reason to commit to many different outlets if the content you produce is not valuable. Whatever you choose, it’s important to stay consistent. In other words, don’t start something you can’t finish. If you’re looking for some inspiration, check out a great cheat sheet here. Create Your Content: It’s time to create your content. Here at SPINX, we update our own blog with tons of great tips and tricks for producing great content, but the main goal is to be informative, serve a purpose, and be engaging. Make sure that your content is relative and timely, so if you have an editorial calendar, make sure to update it often! Distribute Content: Now that you’ve got a solid content marketing strategy down and you’ve mastered your content generation, it’s time to distribute the goods. You need to spend just as much time marketing and promoting your content as you did creating it. Again, keep a calendar and make sure that you distribute your content across all channels, including social networks, email lists, and featuring it on your website. Follow-Up On Your SEO: Last but not least, make sure that you’re getting credit for all your hard work. Set up a Google Alert to be notified any time your content is mentioned and make sure they have linked back to your website. If they haven’t, just send a quick note to request a link back to your site. With time and effort, you can streamline your content marketing strategy to make it work for your business. Produce great content, stay consistent, stick with your goals, and check the SPINX blog often for more great tips! SPINX is a web development and digital agency based in sunny Glendale, CA. We specialize in custom design and online strategy for companies throughout the US. If you need help with your content marketing strategy or generating content, please feel free to reach out to us.